Why do people blog? It’s an opportunity to share experiences, give advice, tell stories and basically shout out to the world “look at me — I exist.” It’s an opportunity to express yourself. And it assumes that there is an audience. Most blogging sites give people the opportunity to “subscribe” to the blogger. That way, you get notified every time a blogger posts something new without you having to check back now and then to see if there is anything new. It also helps the blogger know that people are interested enough to want to know whenever they have something new posted. It lets the blogger know that they have an audience. Most of us can get our spouses or loved ones to subscribe, but how do you get your blog noticed by people that don’t know you? I was writing my blog for three years before I tried this one thing. It doubled my subscribers in less than 24 hours. Full disclosure: My blog had three subscribers for three years and then I made one little change and I had 3 new subcribers in less than 24 hours. I know it was a result of that little change beause it was the only thing I had done differently in those three years. And I continue to get one or two new subscribers after almost every post because I continue to do this thing. What do I do? I “tag” my posts. Tag? Tagging is when you identify all the keywords in your post. Tagging helps with Search Engine Optimization (SEO). Basically, search engines like Google use tags to help people find things. The more tags you can associate with your blog post, the more likely people are to find it. Sometimes it’s easy to tag a post because it’s on a topic like “blog writing” or “playwriting”. But it helps to have a few keywords that might not always seem apparent. The easiest way to do this is to use a site called tagcrowd.com. With tagcrowd, you copy and paste your blog post into the site and press the “visualize” button. It will then create a “tag cloud” — a visual representation of the words that you use the most by varying their sizes. The larger sized words are the ones you’ve used the most often and should probably be tagged. 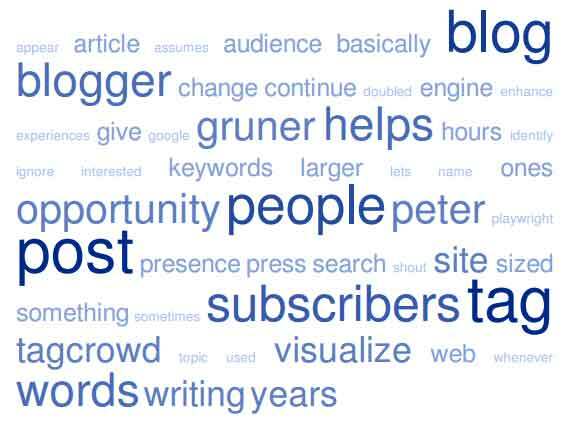 For example, when I put this post in tagcrowd and pressed “visualize”, the following words appear larger than the rest: blog, post, tag, people, subscribers, blogger, helps, opportunity, and words. When I finish writing this article and I am about to post it, I will tag it with those words. I will also tag it with some other words like “peter gruner” and “peter gruner playwright” because I’m trying to increase my presence on the web. There are other “Peter Gruners” out there and I’m trying to make it easier for people to find me. If your name is Peter Gruner and you are trying to enhance your web presence, you can ignore this article. 😉 Otherwise, everyone should be tagging their blogs to help other people on the internet find them and increase their audience. ← Is This the Number One Thing Keeping You From Success?